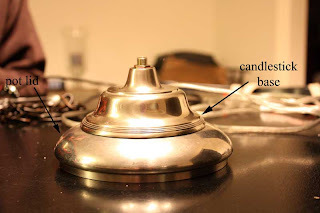 Gus & Lula: Candlestick + Pot Lid = $9 DIY Schoolhouse Light Fixture! 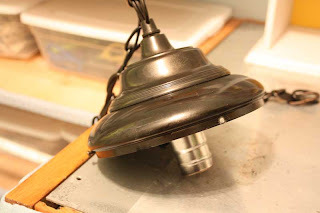 Candlestick + Pot Lid = $9 DIY Schoolhouse Light Fixture! Isn't it cool? For $9? After just a few hours of work it is hanging in our laundry room! 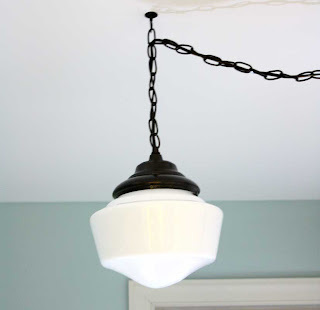 I knew I wanted a schoolhouse fixture in this room, but there was absolutely no way I could drop that kind of money on something that I might be able to make for much less. So I went to Home Depot and browsed their lighting section, looking for inspiration. I found the all the pieces I needed to put together a DIY schoolhouse fixture, but then later I found this gorgeous globe at ReStore and it was just too big to use with any of the parts I had picked up earlier. So I scrounged around the house and found a pot lid that fit perfectly over the top of the globe. And then I found a candlestick that had a nice shape to it & disassembled it so I could use just the base. I had my husband remove the handle from the pot lid and drill a hole through both pieces so that it could be wired for a light. He threaded a hollow bolt through the middle to hold the two pieces together and to attach the socket. I spray painted everything oil-rubbed bronze to match the other fixtures in our laundry room. We drilled three holes in the bottom of the fixture (in what was formerly the pot lid) and threaded screws through them to hold the globe on. And then it was just a matter of hanging it. For a really far-fetched concept, this turned out to be a very smooth, easy project. I do plan to assemble another fixture with parts found at Home Depot that should be easily replicated, so check back! LOVE it! What an ingenious idea! HOLY MOLY! That is too cute! You constantly amaze me. I will see where I need a school house fixture and I am totally using your idea for shower curtain drapery rings in my little guy's nursery! Thanks for the constant inspiration and sassy ideas. Oh my word...I'm blown away! 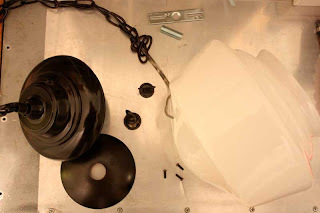 No one would EVER guess that that gorgeous light is made up of such unusual parts! You inspire me to think outside of the box more! Brilliant! I cant believe you put this together at such a thrifty price. Great job! I need new lighting everywhere in my house right now, this in encouraging for me to try it myself. Amazing! I can't believe how creative you are to have come up with that diy solution... plus it's a great look! WOW! So impressive! I just found you through the Nester and am so glad I did. I can't wait to spend some time checking out your archives. I love how you find a solution to your needs/wants for a price you can live with. That's the general idea I use, but you seriously make it happen. I tend to think about it for too long and not get it done. I'll be back! Seriously? A pot lid? You're giving Martha Stewart a run for her money. Great job. That is great! Looks way more expensive than 9 bucks! I have to admit, that was a really creative venture that turned out great! Are you kidding me?? This is aMAZing!! Awesome job, I'm most impressed! So much inspiration on your blog! Awesome job!! You are taking re-purposing to a whole new level. Wow. The light looks great! Seriously. This is the most brilliant projects I have ever seen! Cheap and gorgeous! WOW! That is all I can say. That looks awesome. I'm constantly amazed to see out of box thinking made seamlessly petty with a coat of paint. Nice job! This is such a great idea. It looks awesome. Britt, you are a genius. You have the best successful DIY projects. I love this! Great job!!! I'm having to hold up my jaw yet again! Sheer genius! http://bobbypinsdesignotebook.blogspot.com/. Feel free to take a "featured" button, and keep up the wonderful inspirational and creative posts! Are you kidding me! That's awesome! I totally want it but know that I'm not going to be finding any ol' pot lid and candlestick and whip one up. You rock! Ok, that is worth a FOLLOW! Hi Britt! I love how this turned out and how thrifty it is. I linked to it in my post today. Hope all is well and that you're having a good week! That is awesome! What a creative idea. 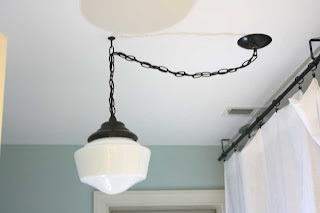 My husband and I made a homemade schoolhouse light fixture using items we picked up at the Home Depot, but we weren't as creative as you were. That is great! A pot lid and a candlestick base? Seriously? You "out of the box" thinkers continue to amaze me with your creativity. I bought my schoolhouse lights for my kitchen from Rejuvenation. 'Cause I'm not a genius DIYer like you!